It had to happen of course. Marine insurance companies took a big hit from the devastation caused when hurricanes Irma and Maria swept through the Caribbean in September 2017. Hundreds of boats stored afloat and ashore in St Martin and the Virgin Islands were destroyed or badly damaged. The view of the insurance companies is that the Caribbean named-storm risk has increased both in terms of frequency of occurence and impact, leaving them with little option but to change their policies. A second policy that provides cover for named storms. Not all insurance companies are prepared to offer the named-storm policy at all. Others, such as Alacazam's insurers Pantaenius, will quote for it. Be uninsured for named-storms, and manage the risk as best they can. Boatyards, as far as I'm aware, insist on boat owners having substantial third party insurance, but named-storm insurance is optional. It's going to be very interesting to see how it all pans out. Fortunately for us, we don't have to decide which way to jump for a while, as 'Alacazam's current insurance policy which includes Caribbean Hurricane Insurance is valid until the end of December - well after the traditional end of the hurricane season. But for next year, we have a big decision to make. One of my tasks that I look foward to least is transferring the outboard motor from its bracket on the taff rail to the transom of the inflatable dinghy. Mary operates the gantry-mounted tackle whilst I guide the 5hp Yamaaha into position from the dinghy. It's a relatively straightforward operation in calm conditions, but when it's rocky and rolly it can get a little more exciting than I would like. If anything slips at this stage, it's likely to get messy. It happened the other day. Caught by an unexpected wash from a powerboat that set Alacazam rolling and the dinghy bouncing, the Davis Outboard Hoisting Strap slipped around the motor. I shouted something rude and made a lunge for it. Mary thought I said 'Let go!' which I most definitely didn't. It certainly added a new dimension to the transfer process. I could see the whole shebang - including me - heading towards where the fishes live. 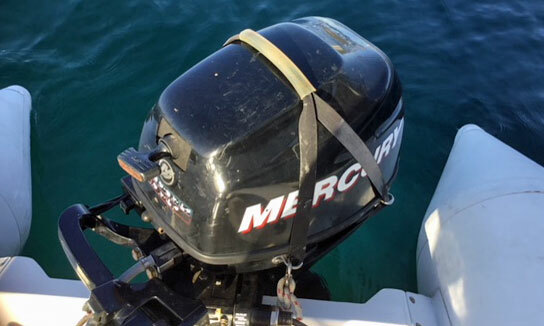 Fortunately that didn't happen, but the event - whilst entertaining for the crew of a boat anchored nearby - would have been avoided entirely had I done what the owner of this outboard had. A couple of stainless-steel stirrups bolted through the engine casing (not the cover), retaining the lifting straps. Simple! I came across an interesting website recently, which offers privately owned boats as floating holiday caravans. If you haven't got a boat but would like to stay aboard one for a while, you can rent one. This isn't a charter - you can't go cruising, the boats are static. Chatting in Alacazam's cockpit recently with a fellow cruiser, the subject of anchor balls arose. An aluminium OVNI cruising boat anchored close by had one. Neither I nor Brian, for that was his name, felt the need for one - anything that could contrive to unwittingly trip the anchor was best avoided we agreed. The easterly wind dropped overnight, and then backed into the north. Dawn revealed all boats in the anchorage had swung to the north - except for the boat anchored nearby which was facing due south. The anchor ball was nowhere to be seen. The skipper, having donned mask and snorkel, soon found it - it was caught up around the rudder. Now had there been any strength in the wind, he could have had a night filled with adventure and excitement. 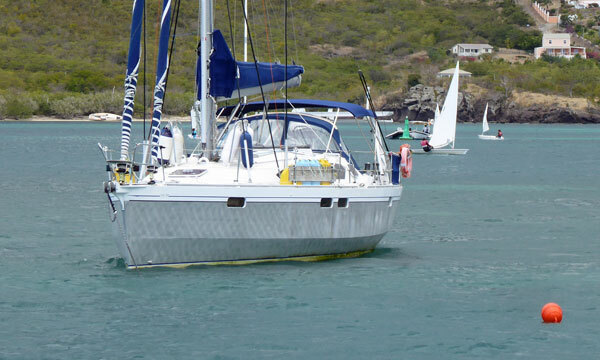 "Too easy" said John Bukowsky about last month's mystery boat (shown below), "it's a Westsail 32". 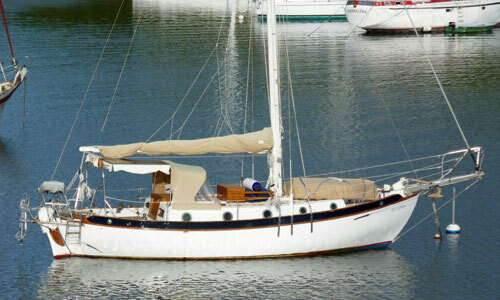 Leonard Webb also was of the opinion that it was a Westsail 32, but they were the only two - so maybe it wasn't so easy. 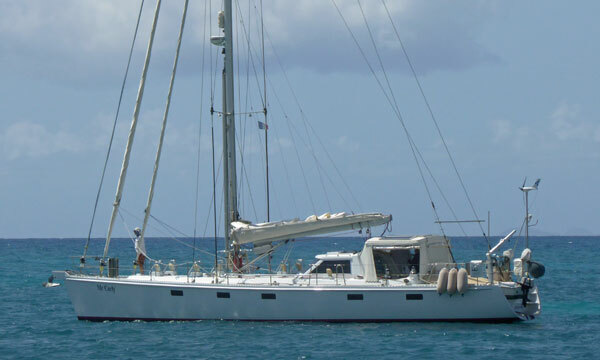 'EllaMia' now appears at Popular Cruising Yachts from 30 to 35 Feet Long. Something considerably larger this month - she's called 'Mr Curly', and I snapped her as she was anchoring off Ilet de Gosier, Guadeloupe. She looks like one of Steve Dashews designs or a Chuck Paine designed Bourgainvillaea, but an internet search suggests to me that she's something different.